Over the past six months BARTA have been working with a dedicated team in Carmarthenshire, Wales who had identified a risk and were determined to make a difference and improve the response to animal related incidents in their local area. The local project team included Lyn Morris, Carmarthenshire Road Safety Officer, Jan Roche, BHS Wales, Ellen Griffiths, Coleg Sirgar, Susan Storch, Dyfed and Powys Police and more recently Alex Baum of Mid and West Wales Fire and Rescue Service. 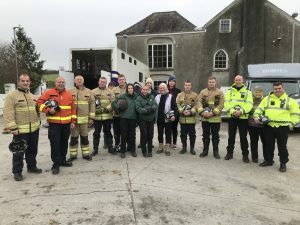 In this drive for change BARTA in partnership with the Horse Trust have worked with the team to design and deliver a pilot course – An Introduction to Animal Incidents. Our approach focused on approved techniques, safety of responders and the welfare of the animals. The learning consisted of pre-course eLearning covering PPE and equipment, keeping safe, developing a plan, legislation and a wide range of species specific information. Included within this were links to the BHS Dead, or Dead Slow? campaign, so relevant to the identified equine risks. It is worth noting that this content remains available to delegates after the course to ensure the skills learnt and knowledge gained is not lost over time. Our delegates were given six weeks to work through the four hours of pre-course content, preparing them fully for the practical day held at Coleg Sirgar. Once again we see an example of how the community is truly supporting this initiative by providing the facilities, access to horses and their time free of charge. Thank You. The initial training has been equine focused and on the practical day our Lead Trainer from the Horse Trust, Charlotte Launder ensured delegates had the opportunity to practice the skills seen in the pre-course content. Starting the day with an experts insight into equine behaviour and handling, we then moved on to practical exercises that included fitting a head collar, improvised head collars, leading a horse, approach and retreat technique, moving horses that can’t be caught and loading and unloading trailers and horse boxes. On the day the weather was fantastic and the facilities were perfect for what we had planned. Everyone involved was engaged and involved in making the day a success and BARTA and the Horse Trust appreciate all organisations for their help and participation throughout the day. BARTA aim to provide advice, direction, training and accreditation for those involved in the rescue and trauma care of animals, in order to maintain professional standards and competencies. Our primary objectives are to safeguard the public and emergency responders and to improve the welfare and viability of animals at emergency incidents.